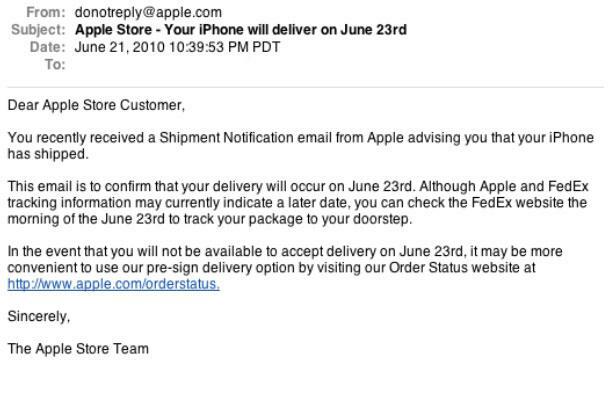 An official e-mail from Apple sent to iPhone 4 purchasers specifically states that delivery of the handset will occur a day early, on June 23. Suggesting it is not a mistake or typo, the e-mail includes the date June 23 a total of three times. That's a day earlier than Apple's previously announced release date of June 24. "This email is to confirm that your delivery will occur on June 23rd," the official note reads. "Although Apple and FedEx tracking information may currently indicate a later date, you can check the FedEx website the morning of the June 23rd to track your package to your doorstep." It continues, "In the event that you will not be available to accept delivery on June 23rd, it may be more convenient to use our pre-sign delivery option by visiting our Order Status website at http://www.apple.com/orderstatus." If the iPhone 4 really is set to deliver a day early, it would be a strange move for Apple, which in the past has gone out of its way to ensure that its announced launch date is held. When the iPad was launched, the devices began shipping a week early, but sat for days at the UPS Worldport hub in Louisville, Ken., awaiting the April 3 launch date.